Concrete, Vinyl Liner, and Fiberglass Pools: Which Pool Is Best? River Pools was one of the first companies in Central and Eastern Virginia to embrace the fiberglass pool industry. Because of this, I have been able to address the concerns of many clients involving the pros and cons of owning a fiberglass swimming pool. Despite the exponential growth of the composite (fiberglass) market throughout the United States, I have found there are still some serious myths regarding the potential drawbacks of owning a fiberglass pool. Hopefully the following paragraphs will address and alleviate these issues. Myth #1: Fiberglass pools will float or pop up. This is one of the most amusing, and most common, of all misconceptions I have heard regarding fiberglass pools. If anyone (especially another pool dealer) tells you that fiberglass pools pop out of the ground, then they are simply being dishonest and trying to use fear to motivate you to get another type of pool. A local company (I will not mention any names here) in the Mechanicsville area loves to tell homeowners that every time there is a hurricane in Virginia, fiberglass pools all over the place float up out of the ground. I personally called this company once and asked them to give me just one name of someone who had a pool float. Of course they were unable to give me such information. During our 9 years in business, having installed well over 600 fiberglass pools in the ground, we have never had a pool float after installation. This is because not only are the pools always full of water, but the concrete deck engulfs the pool's outer lip, making it impossible for the pool to move unless the concrete deck moves with it. I have hundreds of customers who would be happy to verify these facts. Please don't be fooled by anyone who uses this ploy as a means to push a potential customer in a different direction. Myth #2: Fiberglass pools look cheap. Had someone said this 15 years ago, I would have agreed with such a statement. With so many options and features to choose from, homes of all value ranges can easily find a pool that corresponds aesthetically with their appearance. When I show customers the pictures of pools we've installed, they often ask if they are seeing concrete pools. This is because fiberglass pools are now very beautiful and look permanent. This is also why customers of all economic classes (we have installed many pools where the home value is well over 1 million dollars) are going with the fiberglass advantage. Myth #3: Fiberglass pools only work in warm climates. This one really makes no sense to me at all. It is an accepted fact in the swimming pool industry that fiberglass has the ability to "flex" due to its incredible tensile strength, much more so than any other type of permanent pool (i.e., concrete). People are concerned about freezing conditions having an adverse affect on fiberglass. However, they're forgetting that when the water in a pool freezes, it expands in an upward direction, where there are no barriers. But the simple fact is that we have never had one customer sustain any damage to their fiberglass shell due to freezing weather conditions. Again, this statement is easily verifiable with our customer reference list. Myth #4: Fiberglass pools are much more expensive than vinyl liner pools. The answer to this one is a little tricky, but hopefully I'll explain myself clearly here. 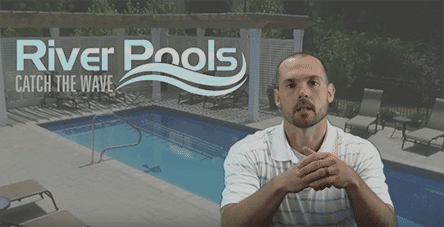 Typically, if someone is comparing a fiberglass pool to a liner pool, apples to apples, features with features, they will find that a fiberglass unit typically runs $5–10k more initially. I say initially because when someone is considering the cost of a pool, there are two different ways to arrive at the number. The first way is by solely looking at the initial cost of the project. The second, unlike the first method, takes the initial price but also adds the expenses of the pool over its lifetime. For example, let's say you spend $25,000 initially for a vinyl-lined pool. The liner will typically last 8 years on average. (This number can be more or less depending on a variety of factors.) Then it has to be replaced, and the average cost of a liner replacement is usually between $3–5k. When you add up these costs, a pool owner could easily spend $8–12k on liner replacements alone during the first 20 years of the pool. The same principle applies to concrete pools. They have to be replastered every 10–15 years, and the average cost for this service is $10k or more each time. This is one of the great beauties of a fiberglass pool. There are almost never large expenses down the road for a homeowner to worry about. A potential pool buyer should figure in the cost of these long-term repairs/expenses, as well as the year-to-year savings on chemicals. It's no wonder why so many consumers are willing to pay more initially for a fiberglass pool in order to pay less and have less headache in the long run. Learn why we expanded to manufacturing fiberglass pools and how our methods revolutionized the industry. Concrete swimming pools vs. fiberglass swimming pools: Which is better? Ahhhh…So the debate rages on. Which is better? Are concrete pools the best choice? Or has fiberglass taken over as the pool of the 21st century? I'm sure you've heard arguments for both. And what you've likely heard has been biased. You see, most installers only install one type of pool. If they install fiberglass, then they say fiberglass is the ONLY way to go. If they install concrete, then they say such statements as, "A pool is not a pool unless it's concrete" or "Why would you ever even consider fiberglass?" or "All of your friends have gotten concrete. You're not going to get something different, are you?" or "You'll never find a fiberglass shape you want." Etc., etc., etc. And if you talk to a friend that owns a concrete pool, they'll likely tell you to choose concrete. Likewise for the friend that owns a fiberglass pool. Fiberglass may or may not be the right pool for you. It is NOT for everybody. Concrete (gunite) may or may not be the right pool for you. It is NOT for everybody. And now for your TRUE guide to picking the right pool for you. You are looking for a VERY customized shape or size not offered in the fiberglass line. An example of this would be an "L" shaped pool or a pool wider than 16'. You are looking for a pool DEEPER than 8'. This would be because you've decided on a very springy diving board and you want to be able to do many tricks and unique dives off said board. You are not concerned with expensive repairs down the road. You are not concerned with the maintenance time you spend with the pool on a weekly basis. You are looking for the LEAST amount of swimming pool maintenance possible on a daily/weekly basis. You are looking for a swimming pool that will likely have no major repairs/expenses (structurally speaking) down the road. You are looking for a quick pool installation. You are looking for a pool on the smaller end of large. In other words, you are looking for a size that is roughly 16'x40' or less. And if you want to listen to the counsel of your friends, listen to the ones that have owned BOTH types of pools, not just one or the other. For example, of the 500+ fiberglass pools our company has installed, roughly 10 of the customers owned a concrete pool previously. Because of the drawbacks of concrete, they chose to take a different route the second time around. These people are the true pool comparison experts. Notice also that I have not mentioned the pool's appearance on this concrete vs. fiberglass page. This is because I have seen absolutely stunning concrete AND fiberglass pools. It's all about the builder's capabilities as well as the buyer's budget. In fact, when our company presents at a home show, many onlookers see our pool photos and assume we do concrete. Of course, this is not the case. It just so happens that both pool types can be very beautiful and elegant, or very boring and cheap, depending on a variety of project factors and decisions. Fiberglass pools vs. vinyl liner pools: Which is better? For years, we've helped pool shoppers compare and contrast the different types of pools available. Many of those people debated the merits of vinyl liner pools vs. fiberglass pools. So let's take a closer look at these two swimming pool building methods and the pros and cons of each. In just about every market, a vinyl liner pool will have the lowest initial price for the installation. This is mainly due to the fact that the material costs for a vinyl builder are the lowest, and the labor isn't too bad either. The majority of vinyl liner pool installations in most parts of the United States fall in the $35–65k range once you figure in both pool and patio. Although vinyl liners have their drawbacks, one of the benefits of a liner is the fact that it, like fiberglass, is not rough on the feet and does not harbor algae growth (unlike concrete/gunite pools). Having an algae-resistant surface leads to less chemical usage during the season and therefore money savings as well. Unlike a fiberglass pool, vinyl liners can be customized into any shape or depth. So whether you want an L-shaped pool, a classic Roman, a Grecian, etc., a vinyl liner pool will fit the bill. Although liner warranties are usually between 20–30 years, these warranties have very little value after the first couple of years because they are very pro-rated. This means the liner loses its value each year. Plus these warranties do not cover labor and water costs during a liner replacement. Although the structure of a vinyl liner pool will typically last over 35 years (assuming it's not a wood-wall structure), the liner itself will have to be replaced on average every 5–9 years. In other words, I've seen vinyl liner pool owners that have replaced their liner 4 times in 20 years and others that have only replaced it once in 20 years. Currently, the cost of a vinyl liner replacement is about $4,000–$4,500 when you figure in labor, liner, and water. For chlorine users, vinyl liner pools can fade significantly in only a few years' time. What this means is that even though the liner itself may hold up, its appearance can be pretty awful once faded out. In most cases, the steps and benches of a liner pool do not match the actual liner. In other words, let's say you have a dark blue vinyl liner pool. In order to have steps and benches, usually white fiberglass structures are inserted and the liner butts up to these units. This lack of color uniformity can make the aesthetics of the pool suffer quite a bit. In recent years, some builders have started overlaying the steps and seats with the actual liner to eliminate this problem. This technology is currently used by few builders, though, because it's difficult to install properly. Unlike a fiberglass pool, which is viewed as a long-term structure without major repairs, vinyl liners pools are viewed poorly by certain potential home buyers. In other words, some home buyers are hesitant to purchase a home with a vinyl liner pool because of its inevitable costs down the road. In fact, I've seen many cases where a potential home buyer requests for the home seller to install a new vinyl liner in the pool as part of the closing stipulations for the real estate transaction. A large majority of vinyl pool builders use an aluminum C-track coping edge for the interior coping of the pool's patio. Although using a C-track makes the process of pour concrete around a vinyl pool much easier, it also negatively impacts the pool's appearance. This is why we at River Pools recommend cantilever coping when purchasing a vinyl liner pool. This is what originally spawned the fiberglass pool movement throughout the United States and the rest of the world. Pool buyers, in general, want a pool that will be low maintenance in terms of chemicals as well as repairs down the road. Fiberglass pools fit this need better than any other pool structure. In their early stages, fiberglass pools were rather ugly, with white being the only finish available and exposed fiberglass coping edges. But now the industry has new mold innovations, colored finishes, and cantilevered concrete. With these advances, fiberglass pools have come to rival the aesthetics of concrete pools. Because of their incredible longevity, the cost of a fiberglass pool over its lifetime is usually much less than a vinyl liner pool. Because of their aforementioned benefits, fiberglass pools will often appeal to home buyers that normally would not have been interested in swimming pool ownership. The main drawback of a fiberglass pool is that they typically go no deeper than 8' and no wider than 16'. This does limit your ability to customize pool shape and depth. For some customers, the higher initial price of fiberglass pools can be a drawback. When comparing a vinyl liner pool apples to apples with a fiberglass pool, the same package is normally about $4–9k higher for fiberglass. For some customers, especially the ones that are thinking in a short-term perspective, this difference can be too much. Editor's note: This page was updated on November 5, 2018.